To participate in an activity, even a day walk or hike, you should ensure you have suitable equipment before undertaking the walk. Prime consideration is your safety, comfort and weather protection. View the full Gear Checklist at the bottom of the page. Most members walk in lightweight quick drying shorts, a shirt, a hat and boots. A fleecy jacket or old jumper and a long sleeved rain jacket are needed to keep out the cold and wet. 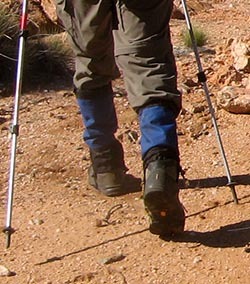 If the walk involves walking through scrub, gaiters can be useful to safeguard against irritating grass seeds and snakebites. Carry all your gear in a small pack on your back. Do not carry gear in you hands as you will need them for balancing. Boots should be comfortable, well fitted, have a strong sole and provide ankle support. Most importantly, they should be large enough to take your feet and at least one pair of thick socks comfortably. The camping shops that specialise in lightweight pack-carrying gear can give professional advice regarding the right boot for you. This is one item that you will not be able to hire. Good sneakers can be worn as an alternative to boots on some of the easier day walks. For Sunday walks, it is only necessary to bring water and cut lunch. Most members also bring snacks for during the day. More details on food are provided on the food page. Many walkers find a gear checklist useful. We have included one at the end of this booklet. Face cloth & soap or moist tissues.